Disney’s animated adaptation of Rudyard Kipling’s The Jungle Book is often noted for being the last animated film produced by Walt Disney himself before his passing. Though hanging that sad bit of trivia over its head as the reason it stands out in the Disney pantheon may be a bit unjust, as there are plenty of other reasons to enjoy this musical animated adventure. The Jungle Book tells the story of a boy named Mowgli, who was abandoned in the jungles of India as a baby, and has grown accustomed to living among the animals through the years, being raised by wolves and befriended by the panther Bagheera. However, Mowgli’s life in the jungle is changed forever when word of the vicious, human-hating tiger Shere Khan’s return to the jungle prompts the wolves to have Mowgli sent to the nearby human village, where he’ll be safe from Shere Khan’s wrath. 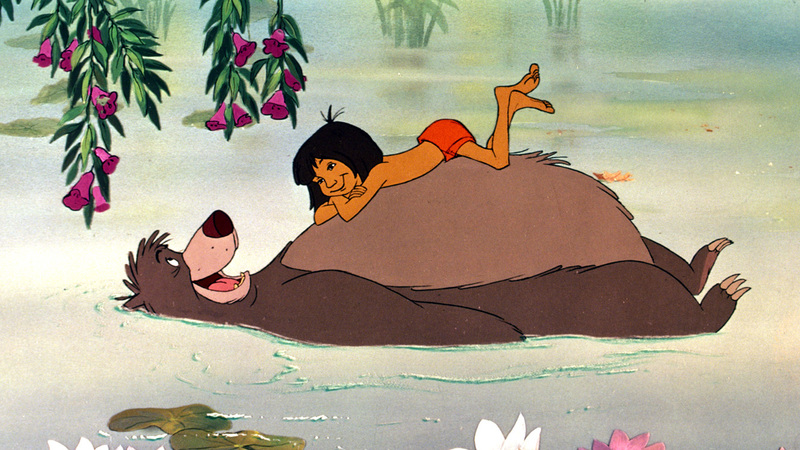 Bagheera is assigned with escorting Mowgli out of the jungle, and along the way, they meet up with the lovable bear Baloo. It really is a simple plot, and admittedly the recent live-action remake definitely adds a good deal of depth and character to the equation (Shere Khan’s entrance in the 2016 film is one of the better villain introductions in recent memory, while in this animated original he just kind of finds his way into the movie about halfway through). Despite its simplicity though, the 1967 film works in its own, different way. The story is a bit looser here, as many animated films of the time were. Its episodic nature working as a means to experiment with a wide variety of character designs and backgrounds, as many scenes in the film seem to be introducing new characters and scenarios that may deviate from the central plot, but provide undeniable entertainment nonetheless. The Jungle Book features some of the best background animation Disney produced up to that point, and the various animals of the jungle certainly gave the animators an opportunity to have a lot of fun with the characters in both design and movements. Baloo seems to be in a perpetual state of dance and rarely slows down. Shere Khan displays mannerisms both regal and vicious. While the snake Kaa provides some fun visual gags with how his coils act like arms. It isn’t just how the characters are animated though, but the characters themselves are very enjoyable. Bagheera and Baloo have humorously contrasting personalities, despite both serving as Mowgli’s guardians. Bagheera being responsible and uptight, and Baloo fun-loving and perhaps a bit dimwitted. King Louie is an eccentric orangutan who wishes to be more like a human (leading to the film’s best song). 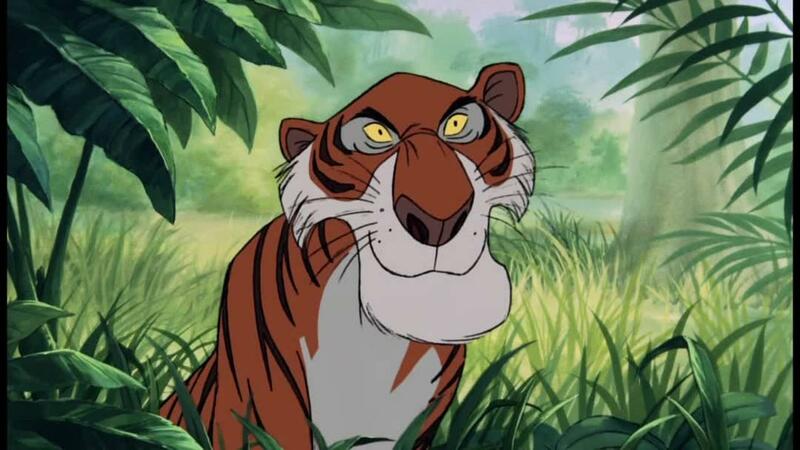 Shere Khan is an effectively despicable villain. There’s a herd of militant elephants who aren’t quite as organized as they like to let on. And there’s even a group of vultures who parody the Beatles. 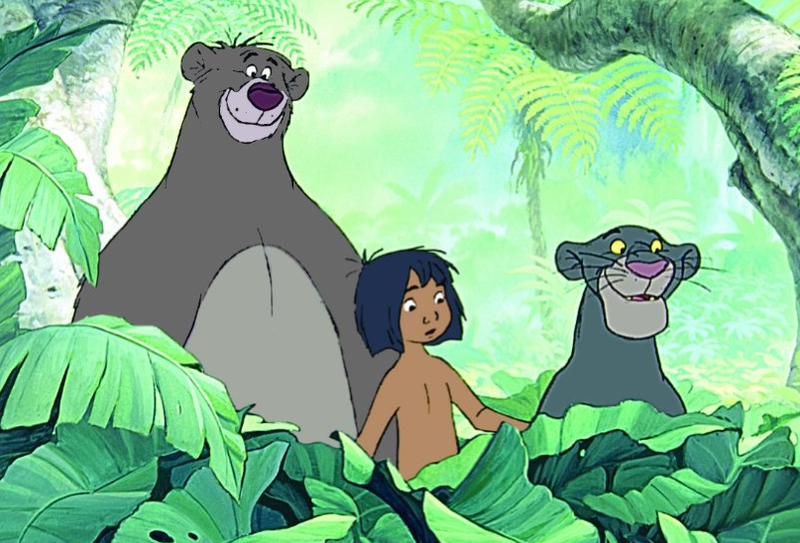 There’s just a whole lot of fun to be had with these characters, and they’re complimented by some of the best songs Disney produced during the film’s era: The Bare Necessities is probably the most famous from the movie, while the aforementioned song that’s sung by King Louie, I Wanna Be Like You, probably deserves a mention in any discussion of the catchiest Disney tunes. The rest of the songs, while perhaps not as iconic, are nonetheless thoroughly enjoyable. Simply put, The Jungle Book is just a very entertaining movie. It may lose sight of its central plot from time to time, and comparisons to the fancier 2016 remake kind of expose some of the areas in this animated original that could have been more fleshed out (for example, the wolves, despite being the ones who raised Mowgli as part of their family, are quickly written off in the animated version). But there’s no denying that the characters are immensely charming, the music is great, and the animation is equally so. Put it all together, and it’s no wonder why The Jungle Book has remained one of the more fondly remembered Disney animated flicks. Awesome review! You are spot on; the movie does lose sight of its plot from time to time, but it is incredibly enjoyable nevertheless, mostly due to its amazing characters. I need to watch the recently released live-action version. It looks really cool. Thanks! You really should check out the new version, it’s really good! Great review! There were a lot of things I didn’t notice as a child like the backgrounds and mannerisms. It’s probably worth a rewatch for me, perhaps before seeing the new movie. I definitely recommend revisiting the animated version and checking out the new one. Both are great. To be honest, I kind of find this to be one of Disney’s weaker films. Of course, it does have it’s highlights – as you said, the characters are very enjoyable (well, except for Mowgli, but I’ll get to him later), the animation is great, and the musical numbers are some of the best of the Golden Age era. The plot, is kind of boring. It’s essentially “Trying to convince Mowgli to join the man village, oh and Shere Khan, Kaa, and a orangutan who vaguely invokes a black stereotype are there too I guess”. It doesn’t help either that Mowgli himself is an annoying twerp. With that said, I don’t hate it – I just don’t find it to be on the level of the Disney greats.